Ecosystem based adaptation (EbA) is considered an efficient, low-cost and sustainable method to adapt to climate change impacts. It mainly involves use of ecosystem management, conservation and restoration activities. This approach helps to improve ecosystem functioning and to secure the provisioning of ecosystem services. The fragile ecosystems of the Indian Himalayan Region are facing impacts of climate change in the form of altitudinal shift of habitats and loss of biodiversity. These changes in the ecosystem subsequently affect the livelihoods of dependent communities. Application of EbA in this region can be beneficial in improving the resilience of people to both climatic and non-climatic threats by assuring essential ecosystem services. Use of an EbA approach can also help in providing multiple social, economic and cultural co-benefits for local communities in the IHR. This science brief emphasizes on the need for adopting an EbA approach in the IHR to enhance the resilience of communities dependent on natural resources towards climate change. It presents an example of an EbA response which can be applied in IHR. 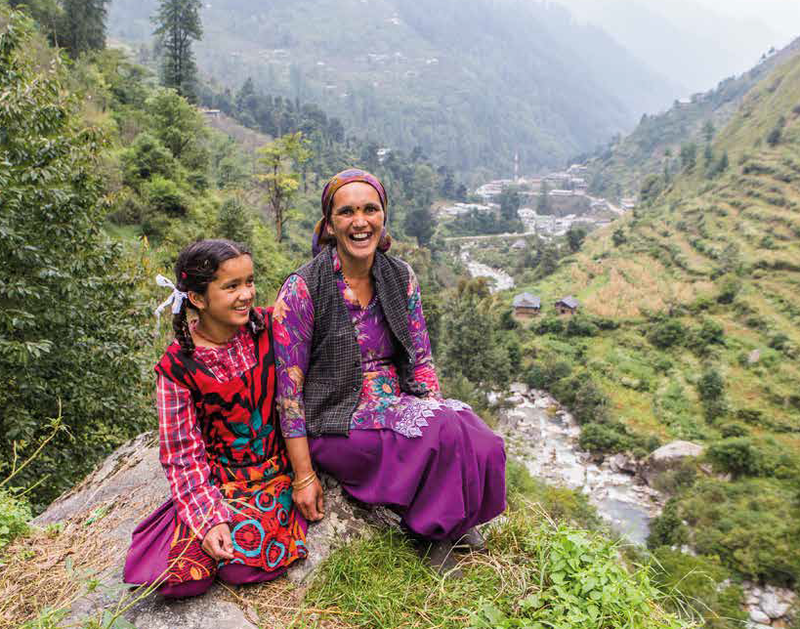 This document has been developed on the basis of experiences gained from a pilot study on integrated assessment of climate vulnerability, hazards and risk for Kullu district, Himachal Pradesh, India conducted under the Indian Himalayas Climate Adaptation Programme (IHCAP), a project of the Swiss Agency for Development and Cooperation (SDC). An example of an EbA response can be to focus on increasing the resilience of forests and its dependent communities by sustainable management of specific species such as medicinal plants. The Great Himalayan National Park (GHNP) in Kullu district, Himachal Pradesh (India) is a biodiversity rich area. The eco-zone, which is a buffer zone of the park, includes approximately 2,300 households in about 160 villages. Medicinal plants produce that are mostly extracted from the wild are a major source of income for the considerable section of forest-dependent communities in the eco-zone. However, several medicinal plant species in GHNP are facing depletion and degradation because of the destructive harvesting methods being used. In addition to the anthropogenic pressures, effects of climate change are likely to exacerbate the impacts on medicinal plants. With increasing temperatures, it is anticipated that there may be an overall decrease in medicinal plants in the forest region in long-term and species of medicinal plants are expected to shift to the higher altitudes. These changes will have direct consequences on the livelihoods of the communities as well. The ecosystem-based adaptation response in this case may be to propagate medicinal plants in the eco-zone of the national park. This may help in enhancing the resilience of the ecosystem in GHNP by reducing the dependence of communities on forest resources. The adaptation response may involve promotion of medicinal plants in privately-owned agricultural land or wasteland of the eco-zone of GHNP. In addition, private nurseries may be encouraged through training and capacity building. As the communities will have better access to medicinal plants from the agricultural or wasteland, these interventions may help in reducing their dependence on forest resources in GHNP. Subsequently, due to reduced pressure, these interventions can lead to enhanced quality of forest resources and biodiversity thereby making the forest more resilient to the changing climate. Integrated approach: EbA allows an integrated approach involving a wide range of ecosystem management, restoration, and conservation activities for achieving the objectives of adaptation to climate change. The EbA concept for GHNP is an example of having an integrated approach as it includes activities ranging from promotion and cultivation of medicinal plants to value chain development and capacity building of communities, thus reducing pressure on forests. EBA therefore contributes towards increased resilience and reduced vulnerability of both socio-economic and ecological components of the ecosystem. Flexibility: One of the biggest advantages of applying an EbA approach is flexibility in implementation. EbA allows accommodating adjustments and incremental implementation depending on the level and degree of climate change across the lifespan of the project (planning to implementation). As the costs involved in the implementation of EbA interventions are relatively low, adjustments in plans can be made in order to address the uncertainties related to climate change. For example, in case of EbA concept for GHNP, if the propagation of a certain species of medicinal plants fails to deliver the desired results in case of changing climate, then suitable adjustments can be made. This may include promoting an alternative species which is more suited to the changed climatic conditions. Iterative approach: From an implementation perspective, EbA allows an iterative process with regular monitoring to address the uncertainties involved in climate change. Monitoring and evaluation (M&E) frameworks and protocols pre-defined at the beginning of the project and integrated in the overall adaptation implementation plan help in ensuring that the process is iterative. Regular monitoring of the interventions such as in the example of EbA concept for GHNP can help to track their impacts and any deviations arising due to the changing climate. EbA enables utilizing the existing institutional set up to be used for another EbA intervention with relatively fewer issues as compared to other adaptation strategies. Targeted Research: Owing to limited knowledge on impacts of climate change on ecosystems in IHR, there is a requirement of further research on EbA to facilitate formulation of more concrete and specific adaptation options. The scientific knowledge generated through research should be combined with traditional knowledge to help in having a complete understanding of climate risks, impacts and required adaptation measures.